Matti Breschel was voted the Danish cyclist of the year 2010 by readers from the Cyclingworlds magazine. 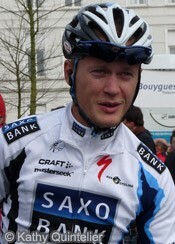 He beat his former Saxo Bank teammates Chris Anker Sørensen, Jakob Fuglsang and Alex Rasmussen. Breschel races for Rabobank in 2011. Breschel was all smiles when he found out that he won. "I am very proud of course. It is great that my performances are honored," he told the Ritzau news agency. Breschel enjoyed a great season, capped by the silver medal at the Geelong road race in the World Championships. He won two races this season - a stage in the Post Danmark Rundt and the Dwars door Vlaanderen - Waregem in March. In addition to that he had several podium finishes: Third places in the Tour of Qatar (team time trial), Tirreno - Adriatico stage one, Paris - Bourges and Gran Piemonte as well as second places in stage four of the Tour de Suisse and stage two and stage six of the Post Danmark Rundt.